OMG! Pigs fly. I like something about George W. Bush. A lot. After spending more than a decade having almost physiological-chemical reactions anytime I saw him, getting the heebie-jeebies whenever he spoke — after being sure from the start that he was a Gremlin on the wing of America — I really like the paintings of George W. Bush. 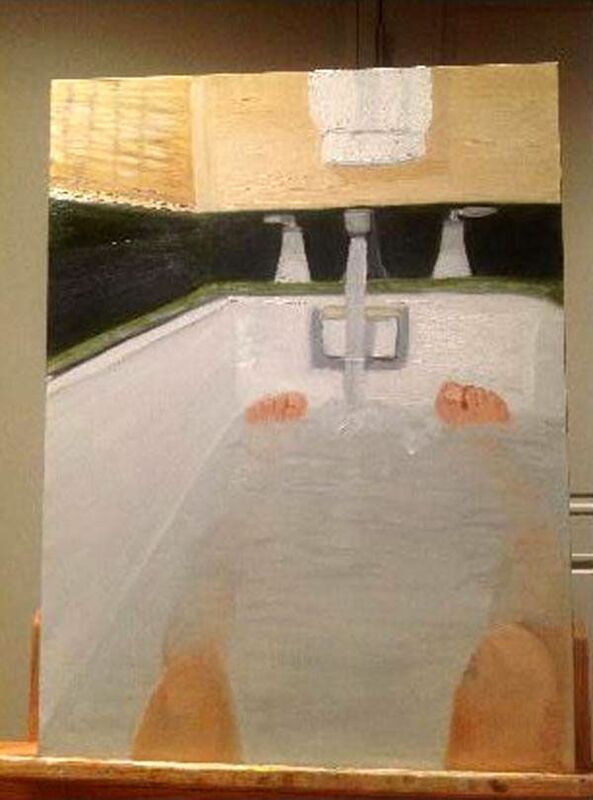 A hacker today released what are apparently Bush family photos and three of W’s own “in-progress” paintings. They all look finished to me. We knew Winston Churchill was a painter. But George W. Bush?! Our W.! I didn’t even think he had an inner life, let alone a muse that called him to art! Gawker calls them “awkward” and “simple.” Gawker is wrong — way wrong. I saw only three images. One of W in the act of painting. I love that he wears a baseball cap. Better yet, he paints in the weight room! There are mirrors and equipment all around. 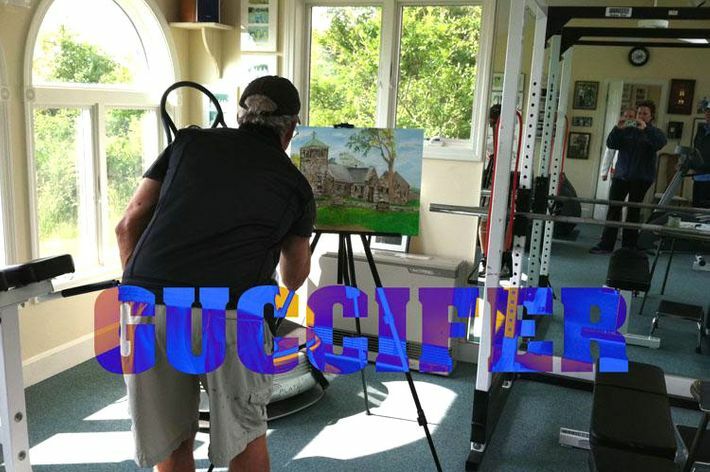 What other artist paints in his own weight room!? He is putting touches with a little brush on what looks like a stone house, maybe his own Texas ranch, maybe a settler’s farm. [Update: The building is actually St. Ann’s Episcopal Church in Kennebunkport, Maine, the seaside town where Bush spent much of his childhood.] The architecture strikes me as real and imagined: a small central home with maybe an addition, and a large round silo. There appear to be two crosses atop this overall structure, one on the main house and a larger one on the silo. American Gothic indeed. The purity of the lone American farmer. Individuality. No neighbors in sight. Alone on one’s own land. It is the isolation of rural America writ in bricks and mortar. Clearly this is not a poor person’s home. The yard is well kept. Two benches allow contemplation of this secret garden. It’s part Grandma Moses, part Thomas Kinkade, part the dry, flickering, detailed brushwork of contemporary artist Ellen Altfest. He should call her. The other two images are not as sentimental. Both border on the visionary, the absurd, the perverse, the frat boy. Each echoes the same isolation in small space. Rumination without guilt. Thought without dark nights. The light in each is soft, subtle, embracing, even oscillating. As if the unreal has become a companion to the painter. 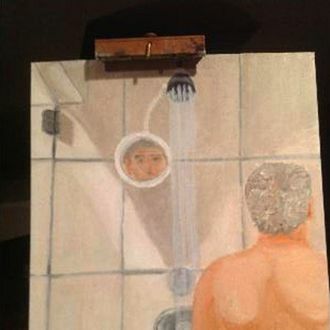 The first depicts a man with gray hair standing in a shower looking at himself and us in a small shaving mirror. We see him only from behind, from the waist up. The shoulders are slightly rounded. The features are Bush’s. In the mirror is that stare, that empty, happy gaze. His eyes look slightly to our left, as if he can’t meet our own gaze and is in a world of his own. The glass shower door echoes the well-to-do nature of the portrait of the stone home. But also the layers of visibility, transparency, fragility. The other picture is the strangest, and the strongest. 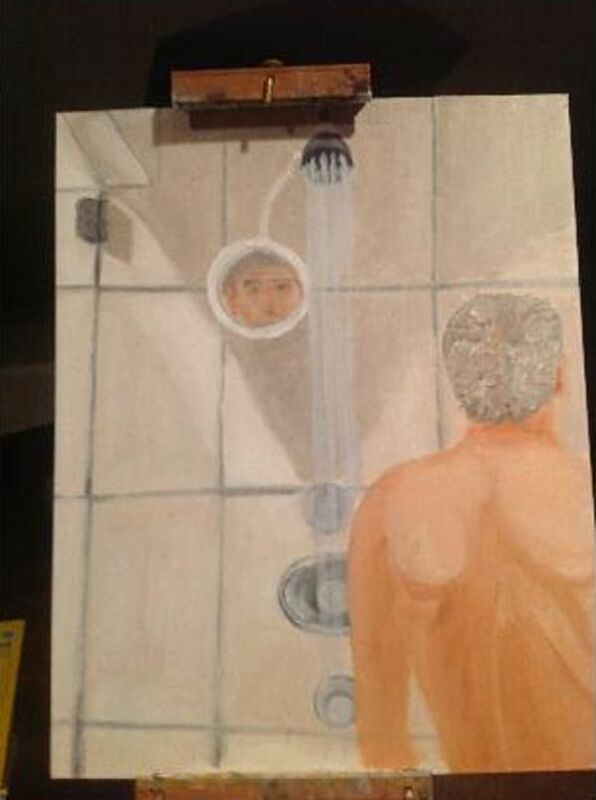 From over his shoulder, we see Bush looking at himself in the bathtub. This means we’ve seen two images of him cleansing himself, in warm water. It’s already enough to set you off on fantasies of aloofness, aloneness, exile, and hiding. Bush regards himself. Yet nothing untoward is showing or seen. He is chaste and untouched even when alone. We see his knobby knees and his toes peeking up above the running water. A Freudian will have to tell us why the water is running in both pictures. Private baptism; trying to get clean; infantile ecstasies; purification rituals? I love these two bather paintings. They are “simple” and “awkward,” but in wonderful, unself-conscious, intense ways. They show someone doing the best he can with almost no natural gifts — except the desire to do this. The reclusion and seclusiveness of the pictures evoke the quietude (though not the insight, quality, or genius) of certain Chardin still lifes. These are pictures of someone dissembling without knowing it, unprotected and on display, but split between the promptings of his own inner drives and limited by his abilities. They reflect the pleasures of disinterestedness. A floater. Inert. The images of a man who saw the entire world from the inside but who finds the smallest, most private place in a private home to imagine his universe. Of almost nothingness. Sweet, sublime, oblique oblivion. The visibility of invisibleness. Paint, George, paint. Paint more. Please. If you exhibit it, I’ll write about it. The Whitney Museum of American Art should get on the stick and offer this American a small show. Or just buy these two paintings. The house, not so much.